I drove to Ta'if on Wednesday afternoon in the company of our hospital's radiologist Dr. Ali Helil. He has actually joined recently, but we have grown to like each other professionally because he is pro-active and sometimes goes beyond the requisitioned test to reach a diagnosis, as he did for one of my patients. Although I had asked for a screening test, he went beyond that, and did some more investigation to reach a diagnosis. On the evening of my arrival, Dr. Ali offered me to stay at his house in a spare room, but I was feeling a little embarrassed to share the house with his family, so I politely declined and went to my usual hotel, Ahle Saif. I have usually booked a room here for SR 80, but I had to shell out a lot more on account of this being the vacation period (SR 140 per night). I had dinner that day and the next day's lunch at Dr. Ali's house. His hospitality is so good that it becomes a little disconcerting at times. I met his wife Mrs. Evelyn Amaro on the second day, and must say that the two of them clearly vibe very well with each other. On the morning of Wednesday, I completed my task of obtaining my Certificate of Good standing from the Saudi Council of Health Specialities. I need this certificate to apply for jobs outside SA, should the need arise for me to move elsewhere. I also escorted Dr. Ali to the Muderiya for some work he had undertaken on behalf of some of his friends in Al Muwayh. We took lunch at his home and I even rested at his house after lunch. In the evening, we went to Shahar street where I purchased a new STC Connect device to use on my laptop at home. 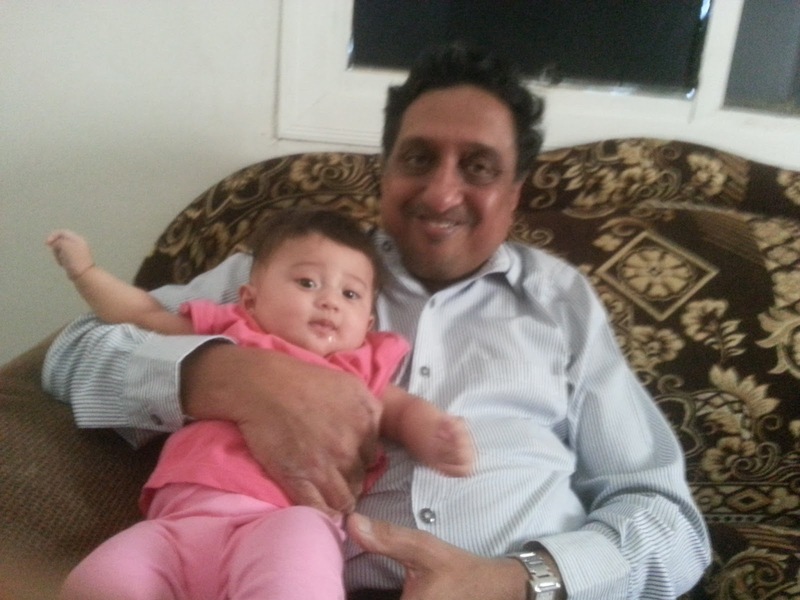 Through the entire two days of my interaction with Dr. Ali, I was privileged to meet his 6-month old daughter Reenad. She is an extremely happy-go-lucky kid who keeps smiling all the time, and when tickled in the ribs, will chortle with a gay abandon. I took some pictures of her too, and am sharing a few with you. Okay, so once again I bungled up with my passwords ... this time, at a crucial moment when I wanted to check my result for the exam that I recently gave, the Part 2 of the MRCPCH. I visited the site on Wednesday evening, and after some attempts at proper logging (which did not happen), the site blocked me! 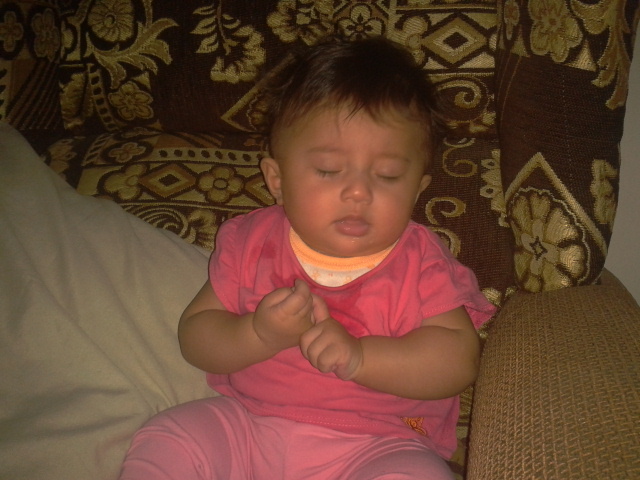 On Wednesday night, I slept fitfully, worried about my result. Day dawned, and I was up at seven o'clock. Considering that I was on a holiday, this was most unusual, but it relates my state of mind better than anything else. I had to wait until almost eleven o'clock before calling the MRCPCH London office by phone (although I had already dropped a line to them by email). They quickly unblocked me, but as I was out, and had to get some repairs done on my car, as well as visit Panda for some purchases, it was nearly one p.m. when I returned to my room, logged into the MRCPCH website (http://www.rcpch.ac.uk) and, muttering a million prayers, navigated to the "Exam results" button ... to find that I HAD PASSED! Relief and joy washed over me as I called up Nishrin, then my kids, then my mom, then some others like Dr. Yasser, a couple of friends and so on. My family was delirious with joy, as I was. After some time, I called up Dr. Ali to inform him that as per his invite, I was leaving my room to go to his house for lunch. He had made an Egyptian dish called Fattah, and also Camel's hooves soup to have. The lunch was pretty heavy. I relaxed with him until half past three, then left to return to my room to rest until sundown. In the evening, I ventured out, bought a few things for my house in Al Muwayh, had a chicken pizza at Osaimi Burger (the outlet is on Abu-Bakker Siddiq road, and I have had tea and even food on several other occasions before). The pizza was great. I could barely finish it! The accompanying Pepsi helped push it down. but I foresee some gastric upheavals tonight as I write this. As expected, I woke up with stomach upset within an hour of falling asleep, beseiged by pain in the stomach area, along with a nausea so overpowering I had to rush to the toilet to induce a vomit. Howver, it didn't end there. The pain and discomfort only worsened over the next two hours. I knew I needed to vomit it all out, so I kept returning to the loo to evacuate my gastric contents. There were huge gobs of cheese that kept coming out, and I retched and I retched. Finally, at half past two, I went out to search for a chemist. (Such shops are usually shut in the kingdom after midnight, and one has to rely on the emergency rooms of hospitals to seek any form of treatment or prescription.) Luckily, I chanced upon an open UNITED PHARMA outlet, and purchased a liquid antacid from there. I went back to my room, and over the next half an hour, I kept vomiting and ingesting more and more antacid, but there was no relief. I tried to contact some of the doctors in Ta'if that I know, but no one picked up their phone. In desperation, at about 4:00 a.m., I drove to King Faisal Hospital, and requested a few tablets of Omeprazole or Pantoprazole (both highly effective acid-secretion preventers), but none was available in the ER Pharmacy. Eventually, I got a few tablets of Ranitidine. With this, I returned to my room, swallowed one, and then, after consulting my own physician in India (Dr. Shabbir Baldiwala), one more. This led to some relief and I continued to lie in bed till noon the next morning. Sleep was intermittent, but enough came to recuperate my body. I skipped breakfast as well as lunch. In the afternoon, I went down and ate half a banana and drank one bottle of liquid curd. With this in my tummy (no longer burning), I went back to sleep for a few more hours in the afternoon. When I woke up, it was nearly half past four. I packed my things, and called up Dr. Ali to ask him if he would be returning with me, but he did not pick up the phone. Hence, I left, returning to Al Muwayh at a little after seven p.m. The adventure, or should I say, the misadventure, had come to a close.